This metal hand coffee grinder will be the best appliance you'll own and is a must for coffee lovers and enthusiasts alike. A good hand grinder can make a world of difference when it comes to brewing the ideal cup of joe. Use as a coffee bean or espresso bean grinder. The slim, sleek cylindrical silhouette with silicone grip makes handling this portable metal coffee grinder so much easier. Forget about carpal tunnel! With an extended handle, manually grinding your coffee becomes less of a headache and more of an enjoyable additional to your morning routine. The stainless steel exterior blends in with most kitchen appliances and kitchen decor, making it a design "win" for your countertops. Why Use a Manual Coffee Grinder Instead of Electric? Handgrounds are a plus for coffee connoisseurs. Once just a barista novelty, hand-operated coffee grinders have recently become more affordable to the general public while still upholding the overall quality coffee lovers have come to know. Manual coffee mills and their burr coffee grinders are much more efficient at grinding a consistent texture across all beans, when compared to electric blades. This allows the extraction process to increase the yield of solubles, whereas electric blades create inconsistent, much too fine grounds. Features: Light-weight, no batteries or electrical components necessary, intuitive, use grounds for cold brew and hot brew. This is hands-down the best coffee grinder you'll ever own. 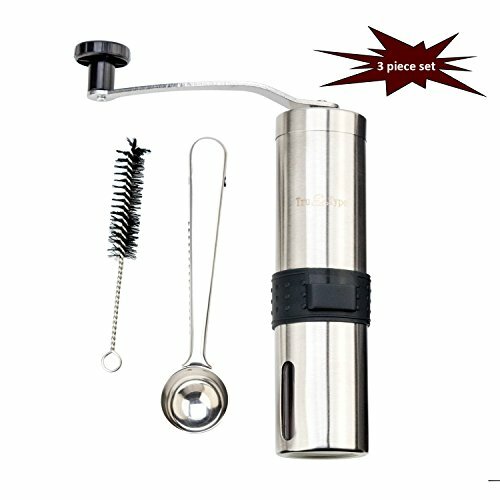 MANUAL COFFEE GRINDER: Adjustable conical burr, with control over the coarseness, for your Pour Over, Drip, Chemex, Cold Brew, French Press, Percolator, AeroPress, Turkish, Espresso, Keurig K Cup, Herb, or Spice grind. COFFEE BEANS: To get the most flavorful coffee possible, buy your beans whole. An even grind is the perfect grind. grinding the coffee is essential to extracting the most flavor out of your coffee beans. HAND GRINDER: The manual coffee grinder is made of stainless steel, with a ceramic conical burr. THREE PIECE SET: Scoop and cleaning brush included, Grinder top detaches for easy cleaning. Scoop has a convenient clip to attach it to your favorite bag of coffe beans. If you have any questions about this product by Tru-Type, contact us by completing and submitting the form below. If you are looking for a specif part number, please include it with your message.